Item Number: 358-5-20W 18058 Actual Weight: 0.1 lb. Jars can be used to package cosmetics and have straight-sided interior wall. 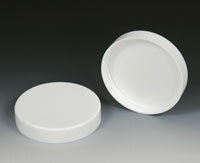 White jars have an included white, smooth wall cap with polyethylene foam lining. Jars and caps meet FDA specifications. Replacement caps sold separately.